Normally, I would advise you to use the best-quality chocolate you can find for truffles. However, this recipe is a little finicky, and does not set up well if the white chocolate has too much cocoa butter. So instead of using couverture white chocolate for the truffles (which contains a large amount of cocoa butter), use white chocolate chips. Also note that these candies, like most truffles, have several extensive chilling periods, so make sure you leave enough time when making them. 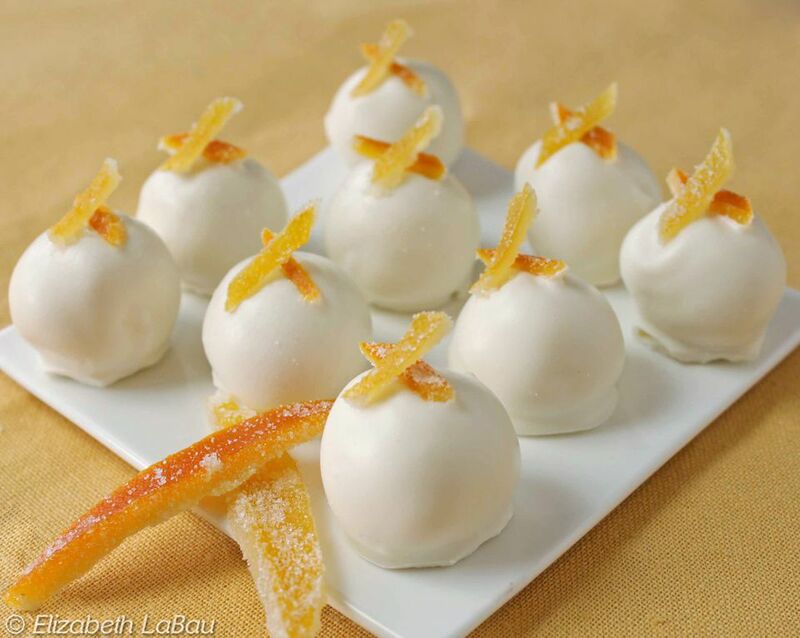 These truffles are lovely when topped with candied citrus peel. You can use store bought or make your own. Prepare a baking sheet by lining it with aluminum foil or parchment paper. Place the white chocolate in a large bowl. Place the cream and citrus zests in a small saucepan and simmer until bubbles appear around the sides of the pan. Remove from the heat and cover. Let the cream sit for 30 minutes to infuse and absorb the citrus aromas. Melt the white chocolate in the microwave or over a double boiler. Return the cream to the heat briefly to warm it, then pour it through a strainer over the white chocolate. Stir gently to combine. Cover the ganache with cling wrap and allow to cool to room temperature. Once it has cooled, place the bowl in the refrigerator to firm up, for 4 hours or overnight. Once firm enough to shape, spoon or pipe 1-inch balls of ganache onto the prepared baking sheet. Repeat for remaining ganache and place the tray of truffles in the freezer to set for 2 hours. Dust your hands with powdered sugar, and roll the scooped truffles into round shapes. Return to the freezer for another 2 hours to make them firm enough to dip in melted chocolate. Temper the white chocolate, or alternately, melt the chocolate with 1 tablespoon of vegetable shortening. Dip the firm centers in the melted chocolate using dipping tools or two forks. Wipe the excess chocolate on the rim of the bowl, and place the dipped truffle back on the baking sheet. While chocolate is still wet, garnish with slivers of candied lemon or orange peel.